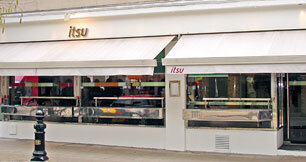 Since its opening in 1997, the name Itsu has become synonymous with chic yet accessible Japanese eating. Owned and run by the same dynamic duo responsible for the hugely successful Pret A Manger chain, Itsu embraces the same principles of freshly prepared food using natural ingredients that can either be selected from the conveyor belt for those looking for a quick yet healthy meal, or there is a full restaurant service for those who have more time to spend. One of four Itsu sites across London, the flagship restaurant in Chelsea boasts an enviable location in the heart of Brompton Cross, wedged in between Chanel on one side and Joseph on the other. When the decision was taken to upgrade their sound system, restaurant manager Dan Levine turned to AV specialists Sound Division to undertake the task. Sound Division's David Graham explained that the brief was to refurbish and upgrade the existing Bose installation and reconfigure it into a multi-zone system. 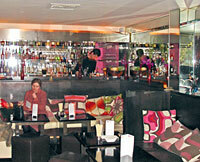 "Stage One of the project was to replace and zone the upstairs level which comprises three sections; the main lounge bar; an intimate 'Cocoon' bar for 6-8 people which can be hired out on a private basis; and a walkway which connects the two," described David. The system is based on the Bose Freestyle Cube range of loudspeakers driven by Cloud amplification and controlled by a Cloud Z4 Mk2 6-in, 4-out zone venue mixer. The music source is a C-Burn hard disk music management system. "In fact, we did such a good job on the upstairs section that Itsu's management team decided to release more budget so that we could do the downstairs restaurant areas as well!" To this end, Sound Division replaced all of the existing ceiling speakers with JBL Control 24C micro ceiling speakers and created a further zone to be controlled via the Cloud processor." Itsu's Dan Levine confirmed that Sound Division had done an excellent job. "They worked cleanly and efficiently causing minimum disruption for our customers, and I'm very pleased with the results. It looks and sounds so much better than it did, and it's extremely easy to operate and control. In fact, once the work upstairs was completed, the difference between the existing system downstairs and the new one upstairs was so flagrant that we had no choice but to ask Sound Division to replace the restaurant system as well!"